Use this page to make any changes to the name or identifier of a school, change the zone of a school, or delete a school. A PDF report of the individual school roster and activity is also available. 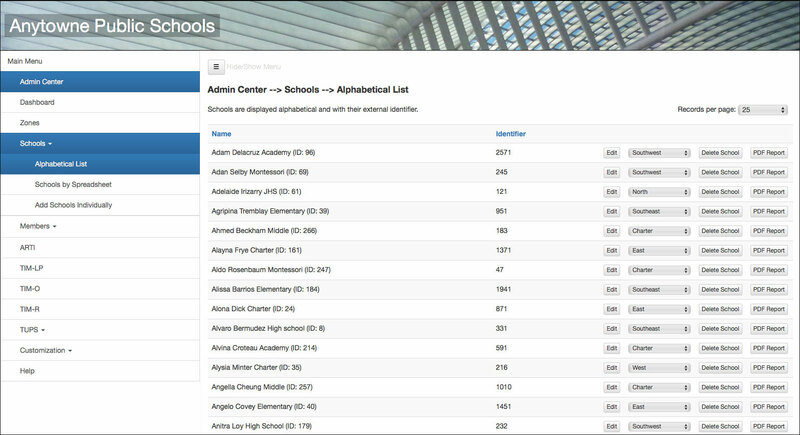 Schools are displayed in alphabetical order and with their system ID and external identifier. The system ID is the internal identification code used by TIM Tools. The external identifier is any alphanumeric code your own system uses. Figure 1. Schools tab showing an alphabetical list of current schools. To change the school name or the related identifier, first click the Edit button. You will then see a form where you can change the name of the school or the unique identifier for the school. You may want to match the unique identifiers to the codes you use in other district systems. The identifier can be any alphanumeric code you wish. It must be unique, however. If you try to assign the same identifier to a second school, you will receive an alert that the identifier is already in use. When you have made the desired changes, click the Save Changes button and you will be returned to the Alphabetical List. Figure 2. School edit window. To change the Zone of a school, use the dropdown menu to select the new zone. Figure 3. Reassigning a school to a different zone. Use the Delete School button to delete a school. Click the PDF Report Button to generate a PDF file of all the data from a particular school. If you have a large district, you may find it convenient to set the Records per Page setting to a higher number. If you have many school changes to make, you may find it easier to make those changes via spreadsheet instead of entering each change individually. Figure 4. The Schools by Spreadsheet section. 1. First, use the Download Schools button to download your current list of schools. When you open the spreadsheet in Excel you’ll find four columns labeled: Your Identifier, School Name, Zone ID, and System ID. 2. Make any desired changes to the School Name or the Your Identifier columns, keeping in mind that each cell in the Your Identifier column must be a unique alphanumeric entry. Add each new school in its own row. Do not edit anything in column D (System ID). Save your spreadsheet somewhere easy to find on your computer. 3. Click the Choose File button and select your revised spreadsheet. 4. Click the Preview Import button. A report will display indicating each change. At this point no data has actually been changed in the database. Figure 6. Schools Upload Preview. The preview shows that a correction has been made to the name Ann Petersen Middle, a change made to the identifier for Art Dunning Academy, and the John Jay Charter school successfully added. The report also shows one error. 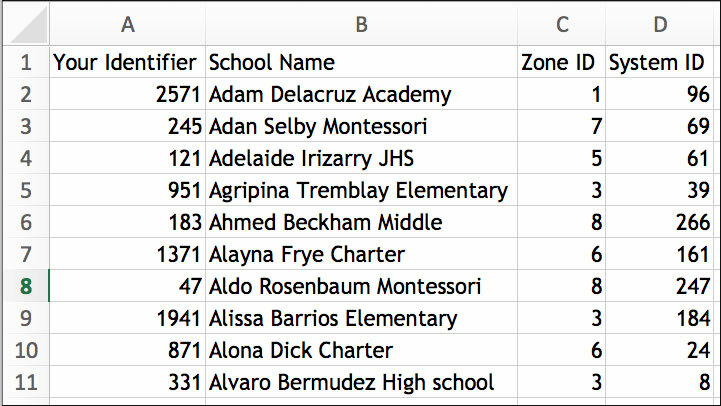 In changing Claretha Posel Elementary from zone 4 to zone 7, the administrator accidently entered “47” into the spreadsheet. Since the district did not happen to have a zone 47, an error was displayed. 5. Apply the changes. You can apply the changes from within the School Upload Preview window by clicking on the Apply Changesbutton or you can close the Preview window and apply the changes by clicking the Apply Changes to Database button. TIP: Be sure to indicate a zone for each school, even if you did not create any special zones of your own (in that case, just indicate the default zone ID for each school). The default zone ID will always be 1. A SCHOOL WITHOUT A ZONE ID INDICATED WILL NOT BE IMPORTED. If you have only a few changes to make to your schools, it may be easier to make them in the Add Schools Individually window rather than using the spreadsheet method. Simply enter a name for the school add your unique indentifier. Then select the zone from the dropdown menu and click the Add Individual School button. The update takes place immediately and you will see a confirmation message that the school has been added. Figure 6. Adding a school individually. “Brand New High” has been entered with an identifier of “999”.